Oilincar — Engine Oil Selection. Please, select category from the menu below. Our service will pick up the necessary oil in engine of your car. Given the parameters of the season and engine type (for diesel or gasoline). The published data is approximated to the manufacturer's recommendations. Example: For winter oil change from 5w-30 to 5w-40, consider the type and manufacturer. Frequent driving around the city greatly reduces life of the oil. All types of motor oils have a lifetime. Such oil cannot be used! On the bottle there's an instruction indicating the mileage through which it's necessary to replace the oil. 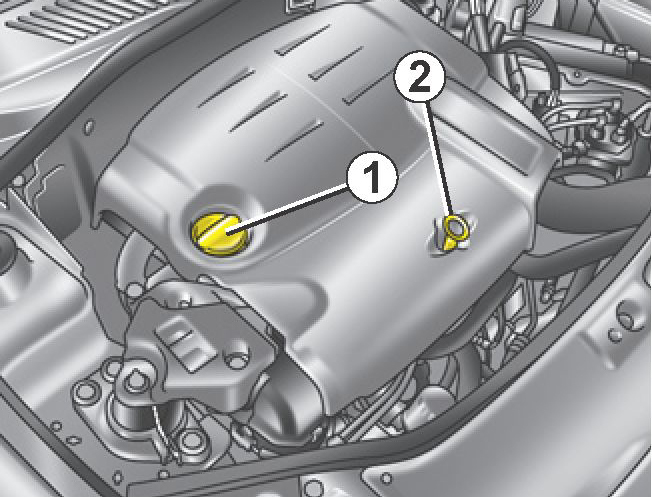 1 — Engine Oil Filler Cap. 2 — Checking oil level. It's easy to make using a drop of oil. Drip on the paper and wait 15 minutes. A drop of oil is absorbed and forms a clear spot. Compare the resulting sample with the table below. The lighter the stain in the center, the better the test oil.